Pro-Brexit campaign group Labour Leave has been fined £9,000 for failing to accurately declare donations before and after the 2016 referendum. The group, which was led by businessman John Mills, did not properly register non-cash donations worth £10,000 relating to the use of office space. The Electoral Commission said there had been a "disappointing lack of transparency" in the group's finances. Labour Leave blamed what it said had been an "administrative error". The group was an offshoot of Vote Leave, the officially designated pro-Brexit campaign group. It has remained active since the Brexit vote, criticising Jeremy Corbyn for failing to put forward a "credible alternative" to the government, and encouraging Labour MPs to consider backing a no-deal Brexit. As a permitted participant in the referendum, Labour Leave - said the watchdog - was required to submit accurate details of donations received before the poll and a full spending return, including donations, after the vote. 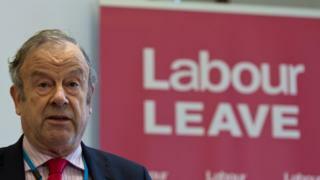 It said Labour Leave had omitted to declare donations-in-kind from John Mills Limited, a company set up by the organisation's chairman, and by fellow Brexit group Better For the Country. For this it was fined £1,000. The watchdog also fined the group £8,000 for failing to declare any donations in its post-poll returns. "The responsible person for Labour Leave had an important legal duty to accurately report all donations," said the commission's director of regulation Louise Edwards. "In this case, they failed to do so, which led to a disappointing lack of transparency in the group's finances." In response, Labour Leave said it had "accepted the fine and paid it, although we feel it was particularly high for an administrative error". "There was nothing undeclared. It was just declared in the wrong part of the form," the group's general secretary Brendan Chilton said. The group said the watchdog's reporting rules were "long, confusing and unclear" and it hoped it would have been given the benefit of the doubt because there was no intention to deceive and it had provided all the information asked of it. "For the avoidance of doubt, Mr Mills declared all of these donations in either the reports or comprehensive accounts that were provided to the Electoral Commission, but the Electoral Commission has determined that these were not declared on the correct forms or accounts," a spokesman added. The watchdog has also fined the Conservatives and Lib Dems £10,580 and £4,750 respectively, for inaccurate declarations of donations in 2017. Five of the Conservatives' six weekly donation reports during the 2017 general election were inaccurate, the watchdog found, while the Lib Dems did not include two donations worth £173,000 in its fourth-quarter report. The Commission said the reporting requirements were clear, so the transgressions were "disappointing".